Having a high quality home gym that best suits your needs is an incredibly important element in keeping you focused on your goals. Body-Solid home gyms are engineered to accommodate your size, your fitness level, your goals, and your environment. Welcome to FitnessZone, where you can find Health Club Quality fitness equipment at a fraction of the price of retail stores. We are deeply committed to helping you achieve your fitness goals with the best home gym equipment, treadmill fitness equipment, elliptical fitness equipment, and home exercise equipment, so you can live life to the fullest by looking and feeling your best! Choosing the right piece of exercise equipment is an important investment in your health and should not be taken lightly. Body-Solid, Pro-Dual, Powerline, ProClubLine, Body Craft and Best Fitness are just a few brands FitnessZone has to offer that will give you the ultimate fitness experience. Call FitnessZone today at 1-800-875-9145 to talk with one of our fitness advisors and let them help you achieve a rapid path to good health, physical fitness and the body you want. 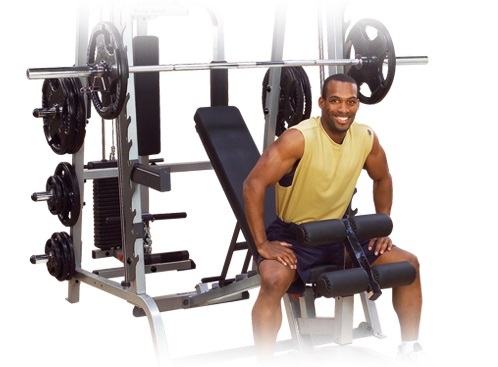 Order your fitness equipment from FitnessZone.com today! We are committed to servicing our customers with all their fitness needs. Leverage safety and stay in control of your workouts! The Body-Solid ProClubLine SCB1000 Smith Machine is the ideal partner for a total body workout in any space-challenged facility. Counterbalanced to a comfortable 13 pounds, the SBC1000 allows any size user to start with an appropriate amount of resistance, then handles up to 1,000 pounds with ease. 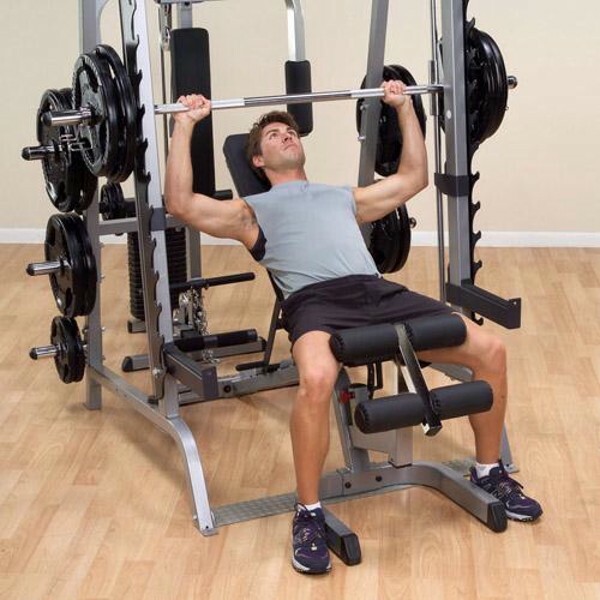 Its reverse pitch and silky smooth vertical carriage ensure freedom of biomechanically correct movement as you move safely and efficiently through routines that can include bench press, chest press, military press, squats, lunges, curls, shoulder shrugs and dozens of other muscle-massing exercises. When you think of Body-Solid, the Smith Gym should come to mind. With literally tens of thousands of satisfied owners across the nation we revolutionized home weightlifting in the last decade when we introduced an economical and practical version of a health club tradition; the Smith Machine. 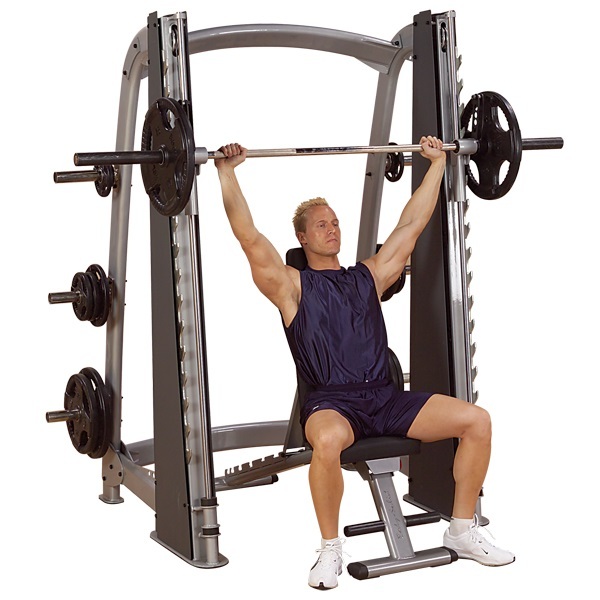 The PowerLine Smith Machine is a true powerhouse that is often imitated but never duplicated. It's a sophisticated combination of free weight power and resistance coupled with the safety and control of a machine. 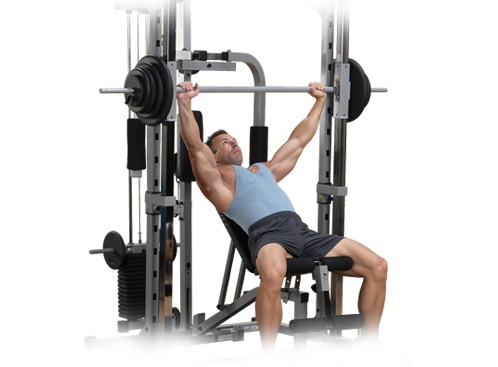 The Body-Solid Pro-Smith Machine uses four 2" x2" 12 gauge steel pillars to support and guide the patented Super-Glide carriage during your most vigorous sets. 14 lockout positions and adjustable safeties assure the lifter ultimate safety while striving for greater muscle gains. PowerLine has taken the best equipment out of the health club and engineered it to their own uncompromising standards. Best of all, we made it affordable! The PowerLine Smith Machine is one of America's favorite gyms with literally tens of thousands of satisfied owners across the nation. We revolutionized home weightlifting in the last decade when we introduced an economical and practical version of a health club tradition: The Smith Machine. For over 15 years Powerline Strength Training Equipment has been saving our customers from the expense, travel time and hassle of joining a gym. From the privacy of your own home you can perform the same exercises to trim, tone and sculpt your body into your ultimate vision, on your own schedule. Body-Solid freeweight systems are engineered to accommodate your size, your fitness level, your goals, and your environment. Owning quality equipment encourages a very important aspect in strength training...motivation. Motivation that will drive you to sculpt your body to its ultimate form. You will get rid of unwanted pounds and replace them with lean muscle mass. Fatigue will turn into a distant memory as you increase your endurance with each repetition. From space saving Power Racks that fit in any room to full-blown Smith Gym Systems with every station imaginable, we give you the features you want at a price you can afford. The following pages contain the most powerful freeweight systems available. Designed to dramatically improve your quality of life and perform smoothly for years to come. Our Series 7 Smith Gym System gives you the freedom of movement you need to do your exercises correctly. 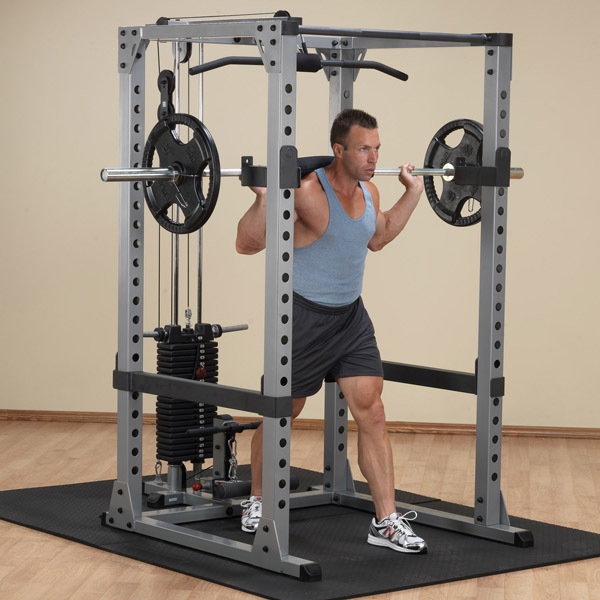 The Series 7 Smith Gym is based on a 2"x 3" commercial quality mainframe and set to a 7 reversed pitch. The 7 angle was designed to allow natural upper and lower body movements for precise chest and gluteal biomechanics. Over 50 exercises are available on our Series 7 Smith Gym System and all of them can be done correctly under your control. Every set, every rep, every movement. That is how you get real results. And there's only one thing you want from your gym system. Results. Call Us at 1-800-875-9145 for best price! Structurally and biomechanically designed for intensive club use, the Pro Club Line features a wide range of equipment that aids stability and comfort, and yields a neutral weight distribution. The Pro Club Line has all the essential components for a great workout experience. Fire up your workouts on one of the first inventions that allowed weightlifters to workout safely and effectively, the Power Rack! commercial multi rack system is the perfect machine for providing all size users a safe and comfortable platform to maximize squats and pressing motions.